next come to line breakout system.it is very simple scalping system.we use 2 indicators cci20 macd8,13,1.those 2 indicators are zerline based indicators.if price crosse zero line from bottom it is buy signal and above zero line is buy area.this applies to both indicators. if you draw a trend line in any timeframe chart.if at certain place you feel that price breaking trend line.then you look for indicators confirmation,if they too support go for trade in that direction put stoploss as swing low or swing high then first target is your stoploss pips.that is you are applying 1:1 risk reward ratio. 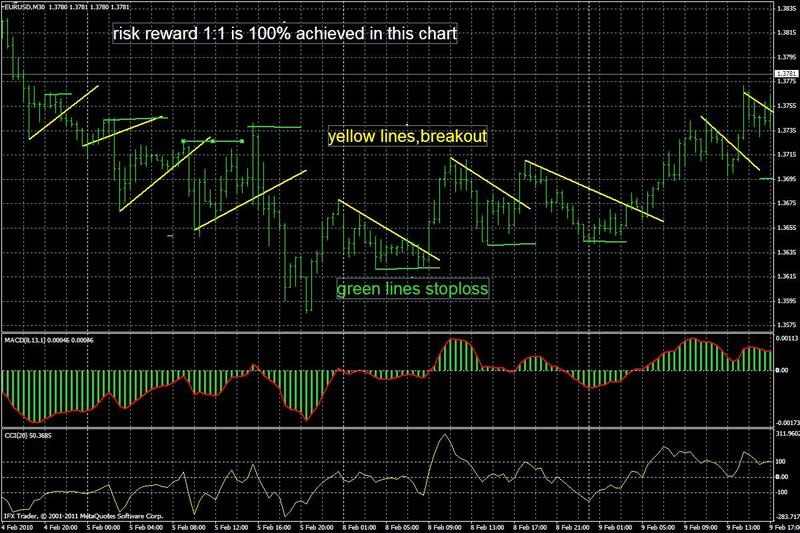 eurusd,usdchf,gbpusd,audusd,nzdusd these 5 pairs i noticed good for this strategy. Can you please tell me if those trend lines could be drawn automatically? I really like this - clean and simple - just add some discipline and you've got a winner !! Are the lines on thei chart from a Indicator? If so how can i try it?